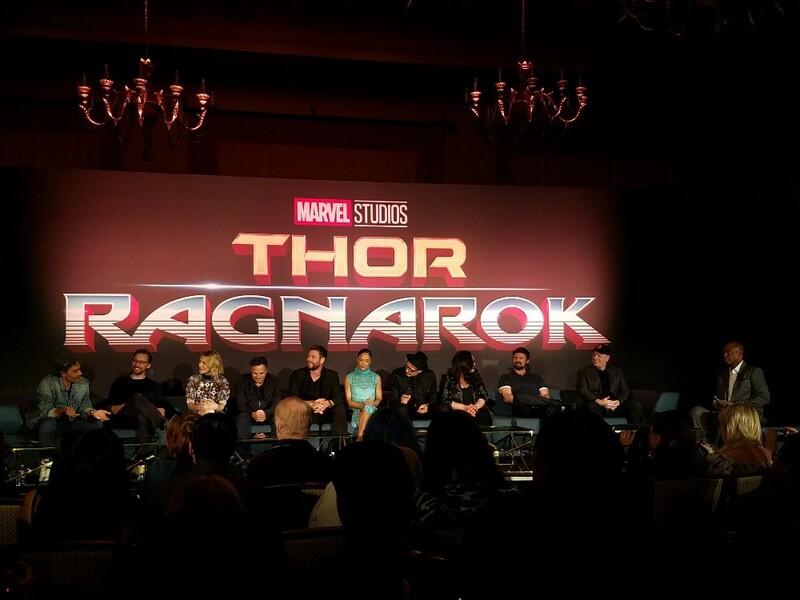 The stars aligned in LA at the Thor: Ragnarok press conference held for members of the media on October 11th, 2017 following the red carpet premiere. It was exciting to see everyone on stage to answer questions and offer a group perspective on the film. The stars, Chris Hemsworth (Thor), Tom Hiddleston (Loki), Cate Blanchett (Hela), Mark Ruffalo (the Hulk), Jeff Goldblum (The Grandmaster), Tessa Thompson (the Valkyrie), Karl Urban (Skurge), and Rachel House (Topaz) were joined by Director (and Korg) Taika Waititi and President of Marvel Studios Kevin Feige. Looking for interviews? Check out my interviews with President of Marvel Studios Kevin Feige, Director Taika Waititi, Karl Urban (Skurge), and live on Monday at 9 am EST Rachel House (Topaz). You can also check out my coverage of the media press conference here. So many questions, not enough time. I had just seen the film the day before, at the LA premiere, you can find my spoiler-free review here. Having been a fan of the Thor film franchise in the MCU since its beginning, I had a slew of questions about the evolution from Thor: The Dark World to Thor: Ragnarok. How did we get here? What does the future of Thor look like? And what’s up with the Hulk? We see a lot more dialogue from the Hulk than any other MCU film thus far, what was it like working with that? The questions in my mind were endless, but of course I really only had the chance to ask one. Other members of the media had some great questions too. The questions from the press covered all kinds of aspects of the film from the heavy-metal inspired logo, comparing the old Thor to the new one, and a full-on Hulk movie to what the heck happened to Lady Sif (that one was left unanswered), what’s it like fighting with Chris as Thor, and how about that Hulk dialogue. Of course, we can’t forget Easter eggs, Hela’s amazing character and the new talent additions to the MCU. So what can I share with you about Thor: Ragnarok that you don’t already know (while keeping it super legit and spoiler free)? Glad you asked. When they first asked me to come to them about making this film, obviously I thought that Marvel had lost their minds, so they’re just hiring anyone now. The main thing – so many options. Keeping your energy up, creatively. Like, my shoots are very short, and I like to work super-fast. All my shoots, about 25 to 28 days, and by – by day 30 on this, I was like, ‘Well, no more ideas. I’m done.’ And you know, you’ve got 55 more days. And so – so I had to like do some meditation, and try and chill out, just to kind of keep my creative energy – just keep it going throughout that whole length of time, ‘cause the – the amount of stress, or the exhaustion really does take its toll, and you don’t realize it’s happening until it’s too late, and then you can’t feel your legs. Thor: Ragnarok is awesome! I highly encourage you to see it in theaters now! Want more Thor? Swing by my Thor: Ragnarok Products Gift Guide and enter to win this EPIC Thor: Ragnarok giveaway with over $200 in prizes. Special thanks to Disney/Marvel for flying me out to LA for this press junket. It in no way shaped my opinions in this post. Thank you for sharing the post! I really like reading fun facts behind the scene. Can’t wait to watch the movie to see how Thor lost his hammer, his wavy hair and his mother’s drapes (just kidding).